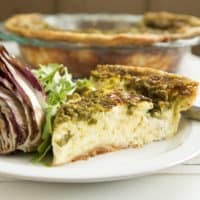 Pesto Quiche (of the Eighties) | Good. Food. Stories. The rom-com role of “sassy best friend” has been clichéd and parodied into oblivion by this point, but once upon a time, there were scene stealers and iconic performances in the genre. And though I’ll always tip my oversized top hat and Kangol to Dionne and Murray in Clueless, if we’re keeping it real, none did it more exquisitely and poignantly than Carrie Fisher and Bruno Kirby in my favorite food movie (and my favorite all-time movie), When Harry Met Sally. While Fisher’s Marie and Kirby’s Jess serve as foils to Meg Ryan and Billy Crystal’s titled protagonists, they aren’t simply there to prop up Harry and Sally’s romantic misadventures until the inevitable final get-together. Instead, the brilliant Nora Ephron gave them distinct personalities, backstories, and a mini rom-com storyline of their own—a counterpoint of a B-plot that’s just as iconic and perfect as the main story. As Vulture recently noted in one of its many deserved tributes to Carrie Fisher, her performance as Marie is impeccable. Marie’s dry, wry wit and world-weary singledom shines through in every scene—a beautiful marriage of Ephron’s words and Fisher’s flawless line readings. And even better, they get together because of food! 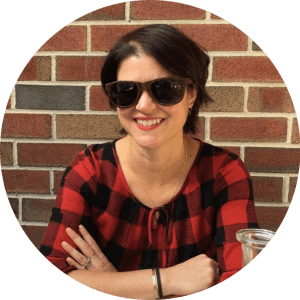 Both Marie and Jess, as culturally aware New Yorkers, appreciate the good drama of restaurants and have their pulse on the trending ingredients and dishes of the moment. Their mutual understanding that “restaurants are to people in the Eighties what theatre was to people in the Sixties” and that “pesto is the quiche of the Eighties” is really what kickstarts their relationship, far more than their mutual disinterest in Harry or Sally as potential romantic partners. In honor of Carrie Fisher and Bruno Kirby’s timeless characters of Marie and Jess, I bring you a pesto quiche of the Eighties. Poor quiche has been a cliché for almost as long as the “sassy best friend” trope, but I think it’s been unfairly maligned. If you haven’t made a quiche in years—or ever—it’s time to give it another go. Yes, it takes a bit of time to blind bake the crust and gently cook the creamy custard filling, but like finding the right romantic partner, it all comes together perfectly and satisfyingly in the end. Serve with grilled radicchio for Sally and some bitter arugula for Harry—with the dressing on the side, of course. "Pesto is the quiche of the Eighties," said Bruno Kirby as Jess in When Harry Met Sally. 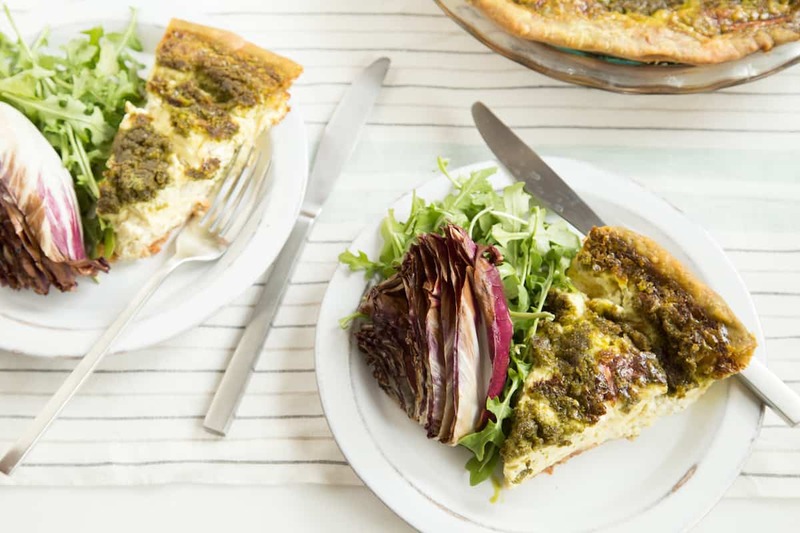 Here's a pesto quiche that pays tribute to Kirby and Carrie Fisher. Pulse the flour, salt, and sugar together in a food processor to combine. Add the butter and pulse 8-10 times until the butter is incorporated in small bits. With the food processor running, drizzle the water and vinegar through the feed tube of the processor, switching back to the pulse function once the dough starts to come together. Pulse a few more times until the dough sticks together in large, moist clumps. Pour the dough out onto a large sheet of plastic wrap and press into a disc. Wrap well and refrigerate for 2 hours. Roll the dough out on a well-floured surface into a circle approximately 14 inches in diameter and 1/8 to 1/4 inch thick. Place the crust in a deep-dish pie pan with a flat edge (like this easy-grab Pyrex pie plate) and trim the edges, leaving enough crust to fully cover the lip of the pan since it will shrink as it bakes. Dock the crust with a fork, pricking holes in the bottom of the dough. Freeze for 20 minutes. Cover with parchment paper and pie weights and blind bake for about 15 minutes, until the dough is baked through and matte instead of shiny. Remove the weights and paper and bake uncovered for 15 minutes more, until the crust is golden brown. Cool to room temperature on a rack. Crumble the goat cheese and sprinkle in an even layer across the pie crust. Top with the Gruyere cheese. Blend the eggs, cream, milk, salt, and pepper together in a blender or in a large bowl with an electric hand mixer. Pour the eggs into the crust. 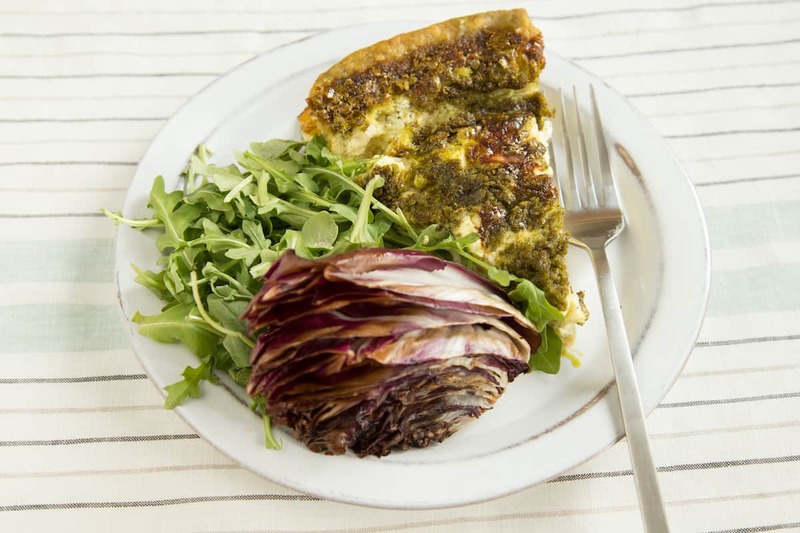 Spoon the pesto into the filling, dropping it gently and evenly across the surface of the filling. Bake for about 1 hour 15 minutes, until the center of the quiche is barely jiggling. Cover the edge of the crust with a pie crust shield or foil if it begins to brown too much before the quiche is cooked through. Cool the quiche on a rack for at least 1 hour before slicing and serving. Crust can be made 2 days in advance; store in a pie keeper or other covered container at room temperature. 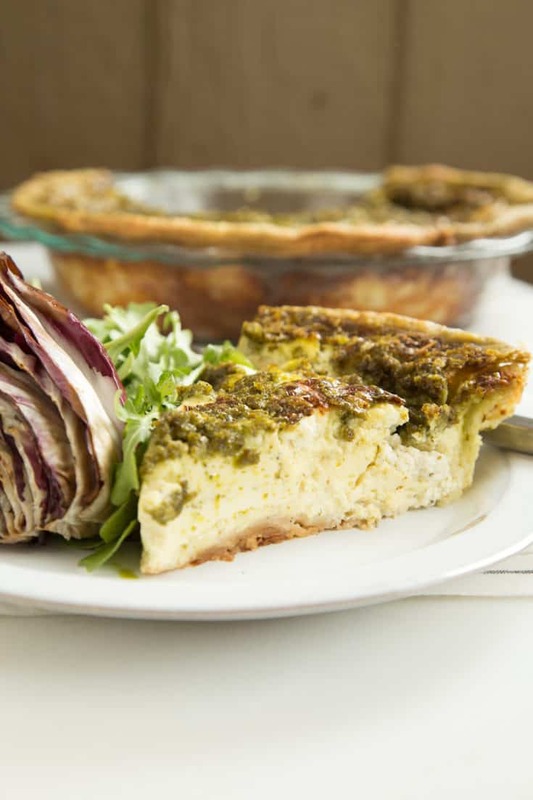 Quiche can be baked 1 day in advance; refrigerate and reheat in slices or serve at room temperature.